‘Tis the time of year to sort things out. To take stock and evaluate. That could mean something deep and philosophical. Or not. Today, it is about Christmas gifts. The tangible and the intangible. Tangible: For me, it means finding all the gifts I’ve bought and stashed around the house (and the garage) over the year. Under the bed, in the closet, in the present drawer in the garage … in bags, boxes and just sitting there. Some are obviously for one person or another. Others surface and I can’t remember why the heck I bought them. This leads to evaluating and balancing it out so my family is covered. And to remembering what is really important. Intangible: There’s an element of letting go — and deciding to hold on tight. Who and what really matters. Yesterday, I learned that woman I greatly admired died of cancer. I hadn’t seen her in close to a year, and had thought she was off on a new adventure. She was, but sadly, not the one I imagined. Give those you care about that hug. It says so much without saying a word. Letting people know you care matters. 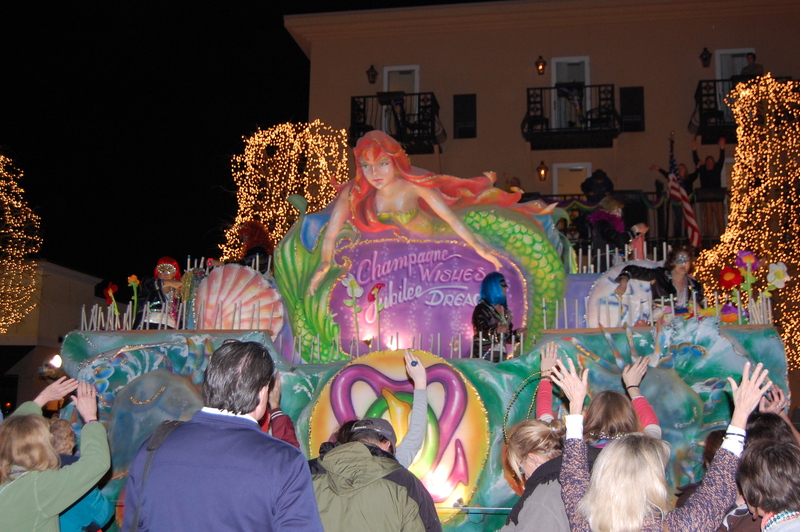 Hometown vs. City Mardi Gras Parades — You Choose! I attended my first two Mardi Gras parades over the weekend – and what a contrast! social groups that up and coming/socially connected women join. A similar parade featured on Feb. 23 focused on “men’s” secret societies/fraternities. Boy Scouts carried flags at the head of the parade, high-school marching bands from Fairhope and nearby Daphne marched, as did an adult jazz group from nearby Mobile. Float riders wore sparkly outfits and masks – and attended a private ball after the event. Spectators included families and tourists – plus formally dressed men and women associated with the “societies” but not on the floats. Visualize men in tuxedos, women in gowns, furs and high heels. To be sure, people roamed the streets with red Solo cups, filled with their libation of choice. Yet it was a very suburban, middle-class, family event. Saturday afternoon, nearby Pensacola, Florida’s Mardi Gras parade couldn’t have been more different — Longer, louder, raucous, more commercial and aimed at a totally different audience. Non-masked, bead-tossing “krewes” tossed beats from dozens of floats sponsored by businesses, casinos, radio stations, civic organizations and social groups snaked through the downtown where thousands cheered. The diverse crowd lined the route three or four deep – lots of singles, college students, as well as families with infants – though I didn’t see many children. Bars sold beer, wine and hard drinks from sidewalk stands – all helping the crowd to whoop it up and release inhibitions. Pensacola is home to the Blue Angels, the Navy’s elite flight team. Pensacola Naval Air Station is the primary training base for all Navy, Marine andCoast Guard aviators and Naval Flight Officers — plus hosts a slew of other specialty training units. At the parade, the very young, enlisted Marine Corps personnel from the nearby Pensacola Naval Air Station stood out. Freshly shaven, wearing their uniforms, likely fresh from boot camp … they watched and enjoyed being off base – but could not partake in wearing beads or drinking. They looked happy to watch. The parade was fun, but more indicative of the city-style celebrations in Mobile and New Orleans … where drinking and flash body parts (men and women) are part of the atmosphere. Mardi Gras did not start in New Orleans, or even in Louisiana. Alabama claims the first event was held in Mobile in 1866. Parades and events start in early February – The Mobile area boasts about 50. Almost all parades in Alabama are followed by a fancy-dress ball. 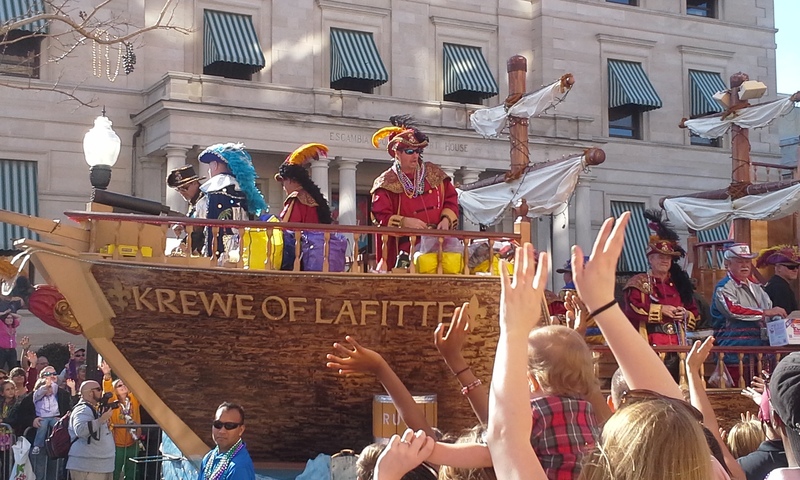 Generally people and/or groups riding the floats must buy their own beads and trinkets to toss at spectators. Beyond beads: Other prizes tossed in these parades stuffed animals, plastic memento cups, glow sticks and doubloons. Beads Hurt! Keeping both hands raised wards off painful hits from the hard plastic chains. How many Madi Gras parades have you attended? Share a story (good or bad)!